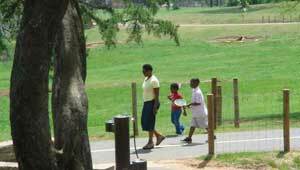 The Trust for Public Land assembled 6 key properties totaling 485 acres for this heavily used park in Gwinnett County. The park has five miles of trails, including two paved multi-purpose trails, a handicap-accessible trail around a pond, and more than two miles of woodland foot trails. Other amenities include picnic pavilions, restrooms, a playground, and an observation terrace at the peak of West Meadow, one of the highest elevations in Gwinnett County.